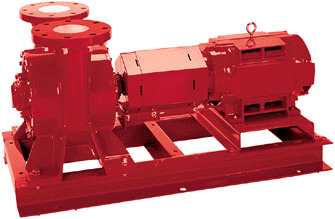 The Series VSC is a double suction pump that has a vertically split casing perpendicular to the pump shaft. The suction and discharge flanges have been rotated 90 degrees to face up, resulting in an extremely compact, space-saving design split case pump. The vertical flanges allow the series to provide up to 9000 lbs. in static flange loading capability. The VSC series is available in sizes from 4 x 4 up to 10 x 10, covering flows to 4000 GPM. The VSC is available in bronze-fitted construction with working pressures up to 300 psig. The bearings and mechanical seals can be replaced without removal of the rotating assembly, reducing the down time required for servicing of the pump. An ANSI-OSHA-compliant coupling guard shields the flexible coupler. A welded steel baseplate and internally flushed mechanical seals are standard features on this pump. Best suited for fluid environments containing moderate amounts of abrasives. Ideal for cooling tower applications. HYDRONIC HEATING AND COOLING SYSTEMS, CONDENSER WATER, COOLING TOWERS, REFRIGERATION AND GENERAL SERVICE.